No matter how many scientists come forward to deny man-made global warming, the left will never give up on this fraud as long as there is money to be had. In his 2006 Inconvenient Truth docufraud, Big Al Gore predicted that the ice caps would melt causing the oceans to rise “up to 20 feet in the near future.” In 2007, the U.N.’s Intergovernmental Panel on Climate Change, attempting to bring Big Al’s scare tactics into some form of reality, predicted a rise of only 2 feet by 2107, or 0.2376 inches each year, which was still enough to those who have fallen under the docufraud effect to earn Big Al another million or two in government grants and speaking fees. In comparison, since the last ice age ended 12,000 years ago, the oceans have risen nearly 400 feet which is only a reflection on the amount of water trapped in mile-thick glaciers that buried much of North America, Europe and Asia. In recent decades the oceans have only risen an average of 7 inches (0.07 per year) per century, which explains why Big Al felt confident enough to purchase an $8.5 million mansion on the California Coast in 2010. No matter how many times the lies are debunked, they never die. There are some that predict the oceans could rise anywhere from 2.5 feet to 7 feet or more by the end of the century, especially around Norfolk, Virginia, home to America’s largest Navy base. Even if the predictions are accurate, they are very misleading. Saltwater intrusion clearly has been an increasing problem across much of this region for several decades with storms sending tides and waves further inland, flooding and battering homes, crops and wildlife habitats. According to Dr. Roger Bezdek, the primary cause of seawater intrusion is not rising oceans, as the left would have you believe. And before anyone starts whining that Dr. Bezdek is another climate denier, let me set the record straight. He is an internationally recognized expert in environmental, energy analysis and forecasting with over 300 articles in scientific technical journals. He has received numerous honors and awards from the White House, the Energy Department, the Treasury Department, etc. and is active with the National Research Council of the U.S., the National Academics of Science (NSA) and served as a member of the joint NSA/Chinese Academy of Sciences Commission, to name only a few. The problem in areas that include the Chesapeake region, the Houston/Galveston Texas area, the Santa Clara Valley in California and other like costal areas around the globe is not rising oceans but land subsidence due to groundwater withdrawal from subsurface shale and sandstone formations along with “glacial isostatic adjustments” that have been ongoing since the last glaciers melted. The solution is not to continue trying to control the Earth’s climate, which is not only impossible, but economically destructive, further impeding impede fossil fuel use, development, job creation, and human health and welfare. Ice age glaciers buried continental land masses under trillions of tons of ice, pushing the land downward, while areas beyond the glaciers were forced up. 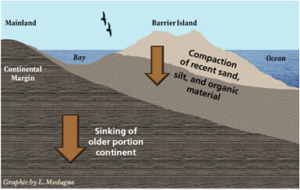 Once the ice melted, the compressed areas began to rise, while lands that had bulged upward began to sink. Isostatic subsidence is still occurring, at about 1 millimeter a year of 4.4 inches per century in the Chesapeake region. 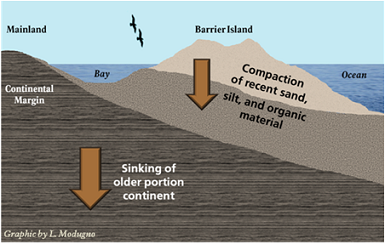 The Virginia Coastal Plain aquifer system involves layers of porous sandstone with water in the interstices between sand grains. These layers are sandwiched between layers of impermeable but wet shale and clay. As water is pumped out, the shale/clay layers are squeezed like a sponge by hundreds of feet of overlying rock and sediment, forcing the water into less compressible sands and then into pumps. Once water has been squeezed out of the clay and shale, it cannot easily be replenished, and thus we cannot reduce the subsidence due to extraction. The best we can do is halt the subsidence by reducing the water we pull from the aquifer. Compression means subsidence, at 1.1 to 4.8 millimeters per year or an average rate of 11 inches per century, on top of the 4.4 inches per century in isostatic subsidence and compared to the average sea level rise of 7 inches per century, the net effect of which can be nearly 2 feet of subsidence per century, having a dramatic impact on land, habitat, saltwater intrusion, inland storm surge, farming, housing, etc. Focusing attention on alleged “manmade climate cataclysms,” leaving the false impression that the entire problem is melting icecaps and rising seas, supposedly driven by carbon dioxide and other greenhouse gas emissions, will result in our wasting hundreds of billions of dollars to replace oil, gas and coal with expensive, subsidized, land-intensive renewable energy systems, while destroying hundreds of billions in job production and economic growth. It would be naïve to believe that counties like China, India, and Indonesia would willingly destroy their economy by submitting to Obama’s EPA ‘s “social cost of carbon” con game. Sea levels will continue to rise or fall in response to ice growth and melting, caused by powerful natural forces over which humans have no control. Glacial isostatic subsidence will continue, albeit at a glacial or geologic pace, unless another ice age buries the continents under more miles of ice, again lowering sea levels hundreds of feet and wiping out arable land, growing seasons and agricultural productivity.